MicroRNAs are a class of small noncoding RNA involved in the mechanism of RNA silencing and regulation of gene expression at a posttranscriptional level. Recently, the discovery of their targets led to the understanding of the molecular role of these small molecules and their involvement in the pathogenesis of numerous diseases, including cancer. 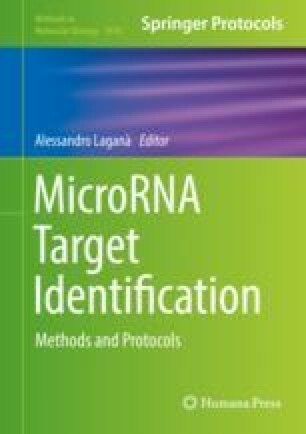 Not long ago, the improvement of several informatics tools for microRNA target prediction has supported the experimental research through the selection of potential mRNA as microRNA target candidates. Since the regulation mediated by microRNA affects gene expression at a posttranscriptional level, the analysis of the proteins encoded by the gene targets is essential in understanding the involvement of these small molecules in biological processes and their role in several diseases. In this chapter, we describe the experimental procedure of Western blotting applied to the validation of microRNA targets. Western blotting is one of the most common and largest know technique for protein analysis. This method, coupled with the luciferase assay, represents the standard procedure for the experimental confirmation of microRNA targeting.